I still remember the time when I turned 23. It was one of the best birthdays I have had until now. A day full of surprises and gifts.. It always makes me happy when I receive surprises. I mean well who doesn’t; I am sure you all love too..
Had you asked me then what would you love to receive my choices would have been totally different? Never had I even in my wildest dream imagined that I would start cooking forget baking but hey that’s what Life is right!! The only constant thing in Life is Change. 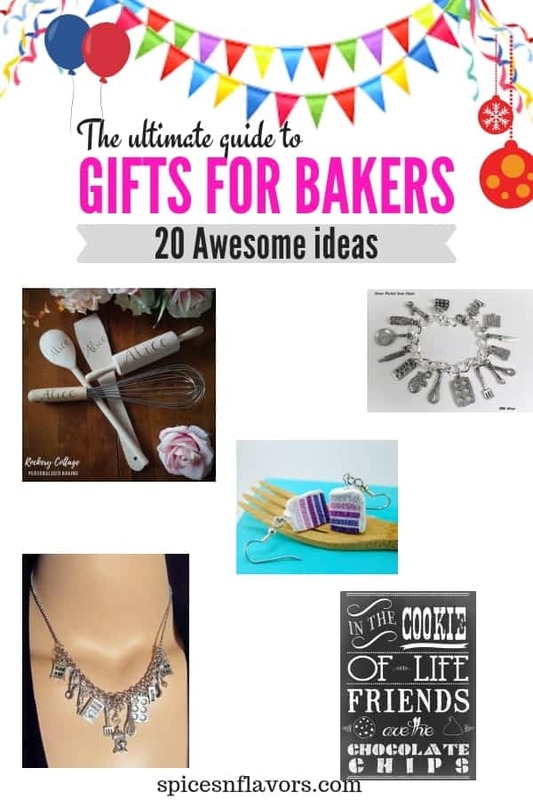 Now that things have changed and I absolutely love to bake, if you ask me now what do you want as a gift you will definitely hear a couple of things from this list of unique gifts for bakers. 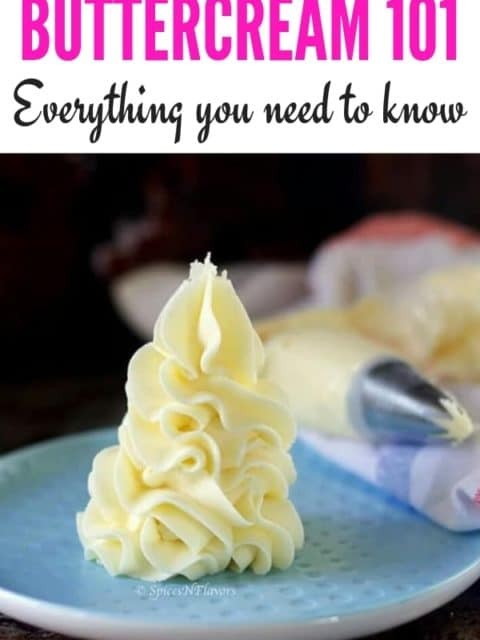 So this post covers everything from basics to advanced, I mean from the basic cake baking tools and equipment you need to start baking to gifts for the baker who has everything. From low budget to high, you will definitely find something worth gifting. So wondering What to buy a baker friend/family this year. 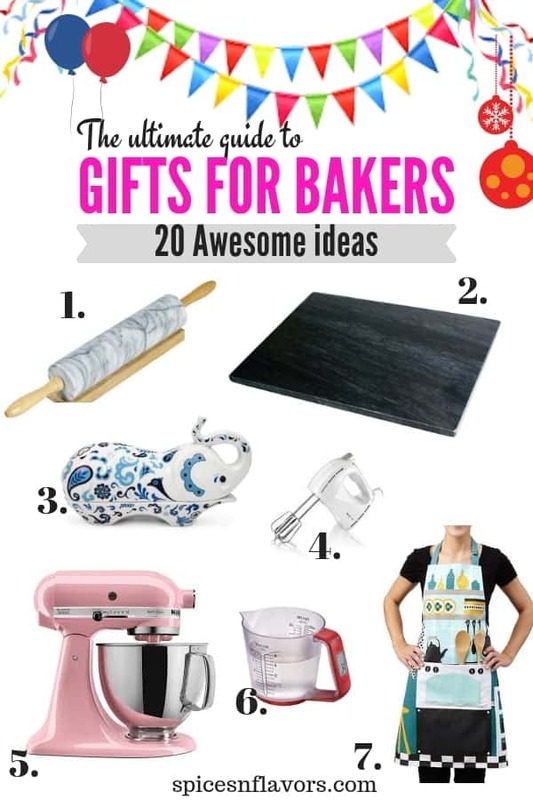 Then look no further I have got you covered with these AMAZINGLY USEFUL Gifts for Bakers!!! Even if you ask a baker in his/her deep sleep; she would reply KITCHEN AID MIXER. That is like a dream come true moment for any baker to own a kitchen-aid mixer. To make an Italian Meringue Buttercream using a stand mixer is like a breeze. But, I understand that it is not that budget friendly however it is like a one-time investment and definitely worth every penny. I myself own a Brabantia Kitchen Mixer, so you can definitely go for other stand mixers too. To be honest, more than my Kitchen Mixer; I use my Philips Hand Mixer a lot. There is nothing that a good quality hand mixer cannot do of course for some recipes like Italian Meringue Buttercream or American Buttercream I prefer to use my stand mixer. But if you are a home baker who has not ventured into a full-fledged business yet then a hand-held mixer would be the perfect choice for you. Here in western countries, we do have the privilege of owning an oven which comes inbuilt in the house however that is not the scenario in India. So if you really want to gift someone something that would be a one-time investment then this oven is my go-to recommendation for you. Take the splurge and invest in an oven and see the changes in your baking skills. 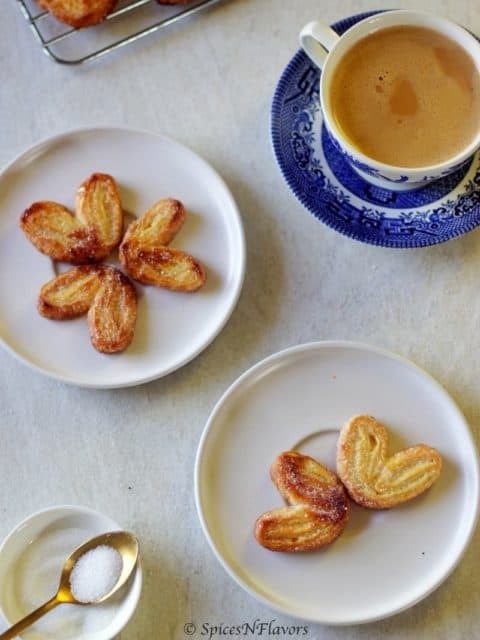 Now that you have the basic gifts sorted let us move on to some baking equipment for beginners. There might have been times when even though your measured and levelled everything out your cake did not come out as expected. That is where you need to think of investing in some Digital Measuring Cups or Scale. You would get many accurate results when you start weighing out your ingredients which is actually the best way to make a cake. That was next set of recommendations for gifts for bakers – Beginners. But if were you, I would only buy a measuring scale as practically it would do both the jobs of measuring the flour as well as the liquid which is the way I do. If you have been baking for some time now then probably you might be owning whatever I just said until now. But the next three things that I am gonna share you probably do not own. Yes gift your baker friend this Black Marble Pastry Board and they will love you forever. Right from making doughs to working with chocolate a pastry board comes so handy. I cannot tell you how much easier it would be if you have a separate board for doing all your home baking. Ask a home baker whether she would like to have a small place in your home all by herself for baking and she would just jump with joy. I personally, would love to own a Black Marble Pastry Board. The next splurge would be to own a Marble Rolling Pin. A rolling pin is absolutely important to roll your dough evenly and that is where something like a marble rolling pin would be handy as it would be easier to apply even pressure using it. Now that you have a board and rolling pin all you need is this serving Butter Dish to make your bread, even more, stand out. Won’t it be cool to own a unique serveware? And my top choice is Adjustable Rolling Pin. Won’t it be so easy to roll your cookie dough evenly when you have a roll like that? Also, not only cookie but I guess its like a blessing for rolling out pastry and tart dough too. Definitely worth a buy. One more tool that I would recommend for cookie bakers is owning a Cookie Press and making a bakery style ATTA BISCUITS with that. Also now that you are looking out for gifts a small purchase of cookie scoop won’t hurt right!!! If your baker friend is obsessed about making cookies then these 8. COOKIE CUTTER SET is also something that you can look into. AAHAAN I also have some gifts for home bakers who love to attend parties to share their lovely baked goodies – A 9.CUPCAKE AND COOKIE Carrier is just perfect for you. Now that we are talking about gifts for all kinds of bakers there are something that a baker would always fall short of and that is CAKE PANS; yes no matter what level of baking you do I totally understand if you want to add one more NORDIC BAKEWARE to your addition. I know; I know your family would not understand your addiction for it but I as a baker totally relate to your love of pans. So if you ever want to gift a baker who has everything she would definitely love to have a Nordic Bakeware for sure. Yes, that is what I am gonna suggest next is gifting someone a complete 11. Macaron KIT. It does sound intimidating to make a macaron from scratch but if you own a kit you would be encouraged to try it as well as you won’t go wrong in terms of sizing and spacing your macarons. And this actually leads onto my next recommendation for you guys which is actually gifting someone the 12. ULTIMATE SILICON BAKEWARE SET. Yes owning a silicon bakeware is so much easier when it comes to handle them and most importantly maintain them. I for one hate absolutely hate to do the extra dishes that I use while baking and it is so much easier to clean a silicon set. 12. A. Silpat Silicon Baking Mat – I own it and absolutely love using it again and again as compared to wasting a parchment paper. Or just gift them an entire silicon baking kit. Since we have covered the basic baking gifts lets move on to some gifts for cake decorators. To start with all you need is a basic decorating tip set. I own this 4 tips collection from Wilton, 1M, 4B, 2D and 2A. These four tips basically does 75 percent of my cake decorating job but I also own this 24 piece tips collection that I bought from a local store. 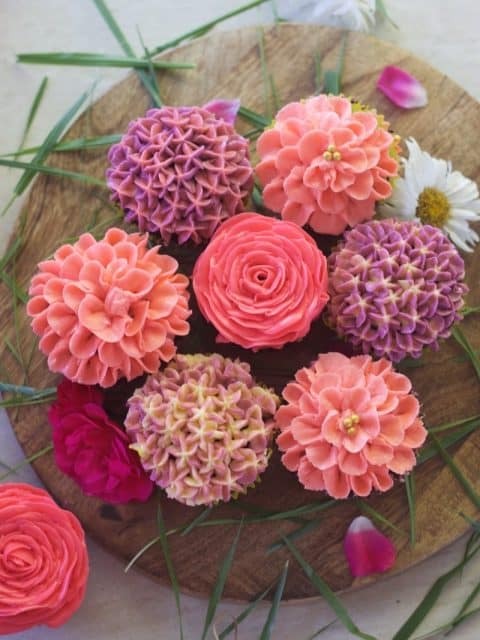 Apart from this basic decorating tips for cake you can also think of FROSTING DECO PIN however I personally do not like it but I have had friends who absolutely vouch for it being useful the choice is of course yours. Another gift perfect for a cake or cupcake decorator is GEL PASTE FOOD COLOUR. Yes it is expensive to buy even a single gel based colour but it is so much essential in cake decoration. So this gel based colour would be the perfect gift for someone who loves decorating. How often have you stained your clothes while decorating? 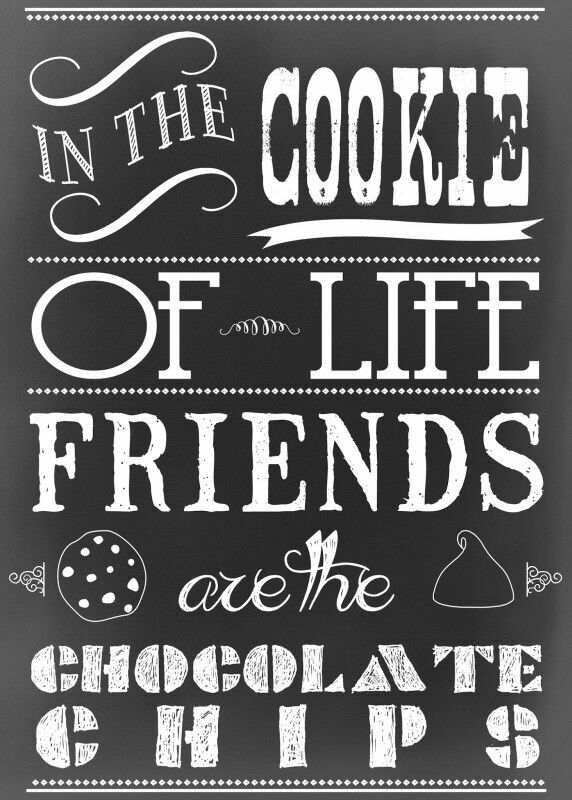 Mine is always covered with chocolate. And that is when I wish for having a classy and elegant looking Aprons. If you are someone who conducts workshops often then this is a perfect gift for you because my mom always says “Aalu paadi; aadai paadi” which means what gives the best impression is a combination of both our nature and our dress. The neater and cleaner we present ourselves the pleasant it would be for the people around us. Definitely gift your baker friend who conducts workshop an elegant Apron. Did you know you can also buy them this Cheat Sheet Apron? It is just so cool. 14. Elegant looking Apron or a Cheat Sheet one. The next thing that I am going to share is what comes under miscellaneous to me. Yes and these are budget friendly too and at the same time super useful. 16. CAKE STANDS – yes pretty looking cake stands like this or this take the way your cake looks to the next level and at the same time a rotating cake stand comes so handy while actually making a cake. 17. COOKBOOKS – I can never have enough of these. Baking Bible is one such book that every baker must have. Still not sure what would be the perfect gifts for bakers? Then trust me you can never ever go wrong with Personalized Baking Gifts. Now that we are talking about personalized gifts your girl baker friends would absolutely love owning these cake earrings, bracelet, a necklace that is just so COOL. My recommendation no.18 GIRLY ACCESSORIES. Finally here are some sites that offer 19.free printables like this and this which you can download, put it into a frame and gift it to your MOM and she would love this more than anything else. Phew, that was one joyful post to put it together. 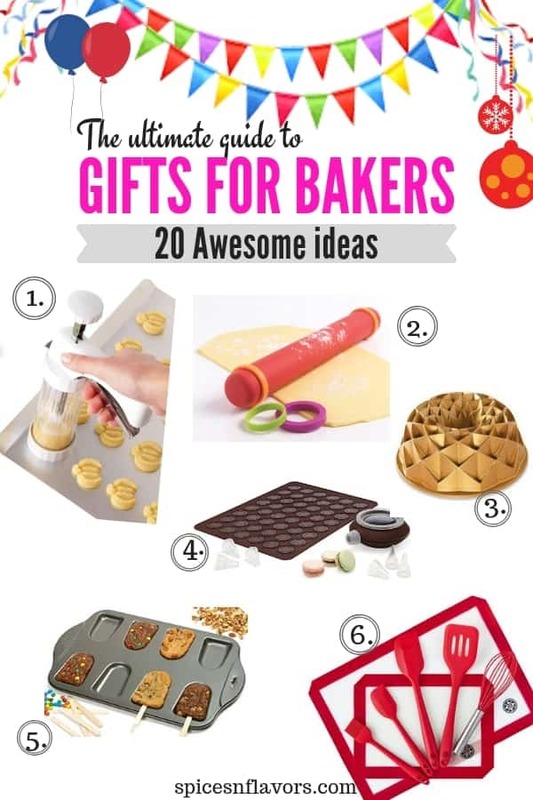 Gifts for Bakers, Amazon is the best place to buy all this online however I would recommend you to check the prices at a local store as sometimes they tend to sell them cheaper. However, if you just wait for a month or so the biggest sale ever on Amazon would be out and you can buy all these for really cheap. Etsy store is also one place that you really can look into. I hope you enjoyed my gifts for a baker enthusiast and if you did just let me know by tagging me, tweeting me or Instagram me. I would love to follow you and your posts. 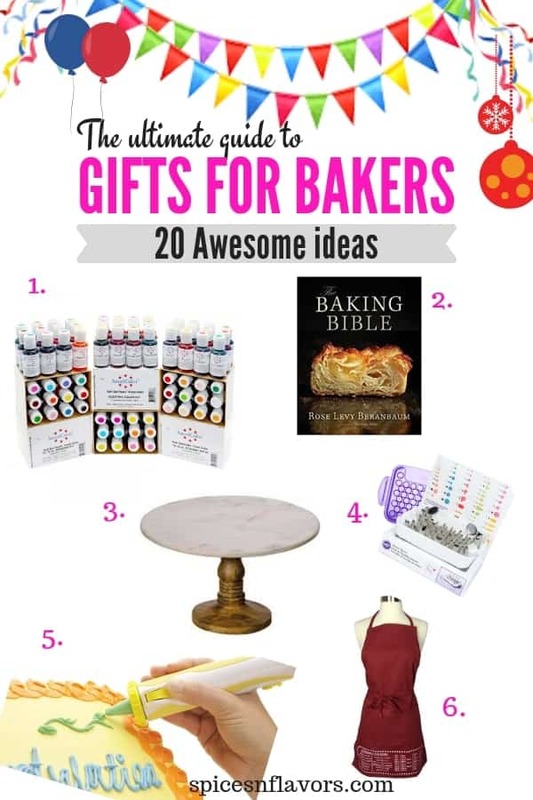 😀 Bribe your baker friend with one or many of the ideas from this Gifts for Bakers post to bake you even more deliciousness!!! Also if you have more recommendations for gifts for bakers then do leave it in the comments below I would try to include that too in the post. That would be beneficial for many. Thank you Sheena.. so glad to know that you wound this post informative..